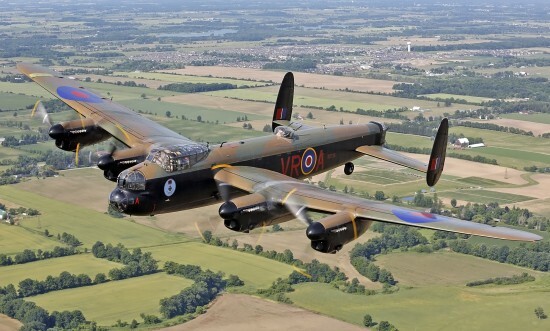 Wings & Wheels is delighted to confirm a once in a life time air display with the Canadian Warplane Heritage Museum’s (CWHM) prized Avro Lancaster which will be flying at the Show on Saturday 23rd and Sunday 24th August 2014. Joining the only other airworthy Lancaster in the world, owned and operated by the RAF BBMF, CWHM will display at Dunsfold Aerodrome as part of a month long tour of the UK. As well as celebrating the exceptionally close British/Canadian relationship, the tour will also commemorate the sacrifice and dedication of Commonwealth Bomber crews and the professionalism of both nations’ air forces today. The home of Wings & Wheels, Dunsfold Aerodrome, has strong historical ties with the Canadians. The Aerodrome began life on 11 May 1942 when the First Canadian Army – mainly the 2nd Battalion Royal Canadian Engineers - began construction of the emergency airfield. After just 20 weeks the site was officially handed over to the Royal Canadian Air Force (RCAF) on 16 October 1942. During the War the Aerodrome was home to the RCAF 400, 414 and 430 Squadrons. Canadian Warplane Heritage Museum President and CEO, Sqn Ldr (Ret.) David G. Rohrer C.D. who is a current Lancaster pilot, comments: “This Trans-Atlantic crossing and visit to the BBMF and England is a "Once in a Lanc Time" event as it will not happen again. A rare window of opportunity was identified to bring the last two flying Lancasters in the world together as a special salute to all the veterans of Bomber Command, many of whom are in their late 80s or older now. We are delighted to be displaying at Wings & Wheels and on an Aerodrome which has such strong links with the Royal Canadian Air Force." As well as the Lancasters, visitors to Wings & Wheels can also enjoy the world famous Red Arrows, Vulcan, BBMF Spitfire and Hurricane, Tucano, Apache and a host of other modern and historic aircraft during the 5 hour flying displays. For four and two wheeled fans, supercars and classic and vintage icons put on an awe inspiring display of power and speed on the Top Gear track in a 2 hour auto spectacular from Brooklands Museum. Tickets start from £20 for adults, £45 for a family (2 adults and 3 children aged 5 – 15yrs), £6 for children aged between 5 and 15yrs and under 5s are free. Hospitality packages start from £150 per person, weekend passes, grandstand tickets and camping are also available. For more information visit [url=http://www.wingsandwheels.net]http://www.wingsandwheels.net[/url] or to book standard tickets call 08712 305 572. Photo: Doug Fisher, Canadian Warplane Heritage Museum.